Years ago, when I was working as Gestalt Psychotherapist, I ran a weekly dream group for a year, which ended on mid-summer’s day, (so we could get Shakesperian and have a Midsummer Night’s Dream). All the members of the group were women and the dreams often synched. I remember one week everyone, including me, had dreams about fathers. I’ve led sessions at Writing Events Bath with Alex Wilson on creating fiction from dreams. 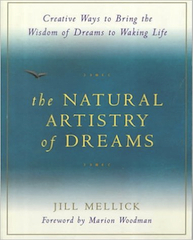 One great exercise we’ve occasionally used was taken from the Natural Artistry of Dreams by Jill Mellick, (Conari Press 1996). Mellick suggests working with a passing dream as if it were your life myth. This exercise can help you drill into the recurrent themes of your life and of your writing work. Title the dream ‘My Life Myth’. Add ‘always’ and ‘never’ where you can. Try it. You’ll be surprised – even if it’s a nightmare dream about Boris Johnson or Nigel Farage. Actually I couldn’t bear the idea of even writing that down as an exercise. Imagine this… ‘Every morning I awake having dreamed that Nigel Farage has mouthed off again…’ But I’m sure I would get beyond the literal if had such a dream and wrote it out in this way. There’s a lot of really good ideas in the book. I recommend buying it. It could inspire you to tap into your psyche and write your novella-in-flash.